What is the boiling point? 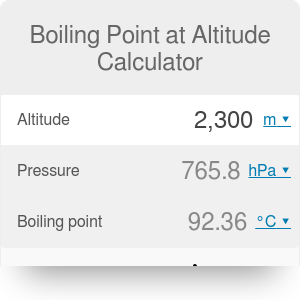 This boiling point at altitude calculator can help you find the boiling point of water. Not surprisingly, the temperature at which water starts boiling is not constant and depends on pressure, which in turn is dependent on altitude. In this article, we will present you with the boiling point elevation equation and explain in detain how to calculate the boiling point of water at any altitude. It is simply the temperature at which water starts boiling - in other words, it changes its state from liquid to gas. This temperature is dependent on pressure and the substance type. Hence, you can be sure that each sample of clear water will start boiling at the same temperature at a given terrain elevation. You don't have to use our boiling point at altitude calculator to determine the boiling point of water at sea level. It is always the same - 100°C, or 212°F. Actually, the formula for boiling point uses this value as the basis of calculations. Similarly, the freezing point of water at sea level is a constant value - 0°C or 32°F. Remember that the boiling point of water depends solely on pressure. This boiling point calculator finds the pressure at altitude assuming that the pressure at sea level is constant and equal to 1013 hPa (1.013 bar). This approximation is sufficient for this kind of calculations. If you want to find more precise results, check out our air pressure at altitude calculator. altitude should be put into the equation in the imperial unit - feet (ft). Let's assume you went on a hiking trip to Machu Picchu. You're wondering what temperature you will need to boil water there. Check the altitude at Machu Picchu (prior to your departure to Peru). It is located at 2430 meters (7970 ft) above sea level. Congratulations! Now you know the boiling point of water at Machu Picchu. Boiling Point at Altitude Calculator can be embedded on your website to enrich the content you wrote and make it easier for your visitors to understand your message.